The world-renowned Kruger National Park offers a wildlife experience that ranks with the best in Africa. Sadly, the wildlife here faces constant attack from poachers and therefore requires teams of counter-poaching units to patrol and protect the vast area from such threats. Ticking off the Big Five is part of the experience but the main focus is to allow wildlife-lovers the chance to gain a hands-on experience of conservation. You also get a chance to give back. Your contribution to the tour enables further conservation efforts throughout the region. Embark on a 10 day South African safari that directly gives back to conservation and local communities. You will be hosted by an elite member of the Dyck Advisory Group’s Counter Poaching Team who will guide you through some hands-on conservation activities that can only be experienced with Where Wild Things Roam Travel. On this 10 day tour you will be visiting Kruger National Park as you enjoy some incredible wildlife experiences. Begin your time in South Africa on a safari game drive and visit a local community and school. Get involved with some hands-on experiences unlike any other experienced in South Africa with counter-poaching units, vets and professionals who work to ensure the safety of the wildlife in the region. Arrive into Johannesburg and transit to flight out to Hoedspruit departing at 09:50am. Upon arrival at Hoedspruit airport at 10:50am you are joined by your tour leader from Dyck Advisory Group (DAG) who will be with you for the duration of the tour. After a short drive to Pezulu Tree House Lodge you have the afternoon to relax and unwind from your flight. At the evening dinner you will be introduced to the Where Wild Things Roam concept in South Africa with an Introduction to Dyck Advisory Group and informative presentation on their conservation efforts. Now is the time to ask any questions you may have about the tour. After breakfast at the lodge you set off early with an exciting open vehicle game drive for the day in Kruger National Park. Kruger National Park is well-known for its boundless opportunities to spot the famous African Big Five - Elephant, Leopard, Buffalo, Rhino and of course Lion. The area of KNP you will explore is adjacent to DAG’s area of operation in Mozambique. The safari will be carried out by a specialised guide to explain and answer all topics related to the bush, wildlife and conservation. A lunch pit-stop is enjoyed in Kruger National Park before continuing with the afternoon game drive. As the sun goes down, enjoy sun downers before heading back for dinner at the lodge. Head back into Kruger National Park for a full day of game viewing. The day provides for a good overall experience at a relaxed pace. You will experience South Africa's natural beauty, capture boastful wildlife photographs and have amazing African wildlife encounters. Lunch is enjoyed inside the park again before returning to the lodge for dinner. After two exhilarating days experiencing the bush and wildlife, enjoy breakfast at the lodge before heading off to Welverdiend for a day interacting with the local community and school. Based on the doorstep of Kruger National Park, the community is well known for its poacher syndicates and activity. Your time in the community is two-fold. As you enjoy their traditions and culture, the members will also enjoy learning from you and the importance of tourism to the area. During the day you will meet with local elders and community leaders who will talk on culture and history and be entertained by traditional dancers. For those people interested, there is also the opportunity to visit the Shangoma (witch doctor). For a real taste of the local way of life, a traditional lunch is enjoyed in the community followed by the opportunity to pick up a few gifts of unique handicrafts including beaded jewellery and wooden carvings. In the afternoon you will visit the local primary school, spend some time with the school children and donate a large amount of school stationery which has been pre-purchased in preparation for the visit (included in your tour price). Return to the lodge for an evening under the stars. Today you will learn all about what the rangers in the counter-poaching team do as you are trained on the basics by an experienced ranger. The course will be conducted at the lodge and covers patrols, equipment, formations, wildlife, night patrolling, bush craft and more. At the end of the course you will receive a certificate by Dyck Advisory Group Counter Poaching. After lunch at the lodge you will have the choice to relax for the afternoon around the lodge or head back to the Welverdiend community to participate in a domestic livestock program. Local dogs and livestock are most community member’s livelihood. Unfortunately, the lack of vet support, medication and high diseases in the area contribute to their demise. The local domestic animals are in poor health and if community members do not have them for their livelihood, they seek alternate options such as poaching. A well-known vet is brought in to train you how to handle and inoculate the various animals or to assist with check-ups. The team will then carry out live inoculations and treatment. Later, you will return to the lodge and enjoy dinner. Today is very exciting as you will spend time gaining an insight into the conservation efforts being made to protect the diverse wildlife of the Greater Kruger National Park and get a first-hand experience out in the field assisting with rhino conservation. Take to the air to spot rhino and collect valuable data to be recorded. Accompanied by the chief vet and rangers, you will locate a rhino and take part in notching and tagging the sedated animal. As the group takes turns going up in the helicopter, the rest of you will be on the ground taking part in the Baobab Tree Planting activity. The Baobab tree is a strange looking tree that grows in low-lying areas in Africa and Australia. It can grow to enormous sizes and carbon dating indicates that they may live to be 3,000 years old. When bare of leaves, the spreading branches of the Baobab look like roots sticking up into the air, rather as if it had been planted upside-down. An old Baobab tree can create its own ecosystem, as it supports the life of countless creatures, from the largest of mammals to the thousands of tiny creatures scurrying in and out of its crevices. Birds nest in its branches; baboons devour the fruit; bush babies and fruit bats drink the nectar and pollinate the flowers, and elephants have been known to chop down and consume a whole tree. By planting a Baobab tree, you are leaving a legacy. You will receive GPS location co-ordinates of your licensed tree detailed on a certificate. Return to the lodge for dinner and reflect on your day. Put into action the ranger training you have learnt and after breakfast head out on a morning patrol and bush walk. As you enjoy gazing upon wildlife from the ground at a safe distance, you will embark on some of the very activities the counter poaching unit undertake on a daily basis. Join in on an actual Ranger Patrol while rangers patrol their detection zones on fence patrols looking for possible poacher entries and snares. Return to the lodge for lunch before enjoying an afternoon game drive in Manyeleti. The 23,000 hectare Manyeleti Private Game reserve is located between the Timbavati and Sabi Sands Game Reserves and borders the world-famous Kruger National Park. In this pristine bush area, you can be sure to experience the best of South Africa far away from mainstream tourist areas. Manyeleti is one of those very few remaining 'secret places'. Enjoy sundowners as the South African sun sets before heading back to the lodge for dinner. Today is your last day in the African bush. It is now you can reflect on the past week’s activities of enjoying the wildlife, seeing the communities that are a part of that and the conservation work that goes on to protect it. After breakfast you head to a rehabilitation centre. A key part of conservation is education and rehabilitation and at the Moholoholo Wildlife Rehabilitation Centre you will learn about the work being undertaken. This unique Wildlife Rehabilitation Centre is a home to many of South Africa’s abandoned, injured and poisoned wildlife. At Moholoholo, staff are often faced with the difficult decision of what to do with an injured or poisoned animal which will not be able to be released back into the wild. As a result, they have a number of “permanent residents” at the centre and at their own cost they use them as “ambassadors” for their respective species. Here you can get up close and personal with these incredible creatures and with their hands on approach. Staff have the ability to demonstrate to the public the threats and problems our wildlife is facing today. Enjoy lunch in the local area before heading out to Blyde River Canyon for a cruise with sunset sundowners. Marvel at the splendour of the third largest Canyon in the world, unquestionably being the largest ‘green canyon’ due to its lush subtropical foliage. Here, an abundance of wildlife will keep you distracted while learning more about the natural history of the Blyde Canyon as the sun sets and you enjoy sundowner drinks. The Blyde River canyon supports a large diversity of life, including numerous fish and antelope species as well as Hippos and Crocodiles, primate species and a diversity of birdlife such as the African Fish Eagle, African Finfoot and much more. Return to the lodge for dinner and an evening to look back on the week of experiences you have had. After breakfast, depart Pezulu and transfer to Hoedspruit Airport for your flight to Johannesburg, departing 11:20am. You arrive in Johannesburg at 12:20pm and transfer to Sandton to check in to the Radisson Blu Gautrain Hotel, Sandton, Johannesburg. Lunch will be at your own expense which you can have at the hotel or venture across to Nelson Mandela Square. The afternoon is yours to enjoy free time before the farewell dinner that evening with an African flare. Enjoy breakfast at the hotel and have your bags packed and settle any incidentals at the hotel and check out. Your luggage will be stored at the hotel for collection later in the day before your flight. Head out for a Johannesburg City Tour where you will visit Soweto and explore deep into the township culture, stopping for lunch on Vilakazi Street, where you can see the former home of Nelson Mandela and past the home of Archbishop Desmond Tutu. In the afternoon you head to the trendy pop-up market, Markets on Main, hosted by Arts on Main. Market On Main is a weekly up-market market that trades in regional foods and local design. Here is a great place to taste some of the local flavours, enjoy the music and shop for a few souvenirs before heading back to the hotel to collect your luggage and on to the airport for your flight home. Airfares to Johannesburg are additional and can be arranged to suit your travel plans. Pezulu is a small, exclusive, unique Tree House Game Lodge situated near Kruger National Park in South Africa. The Tree Houses are all situated in a tranquil bush setting. 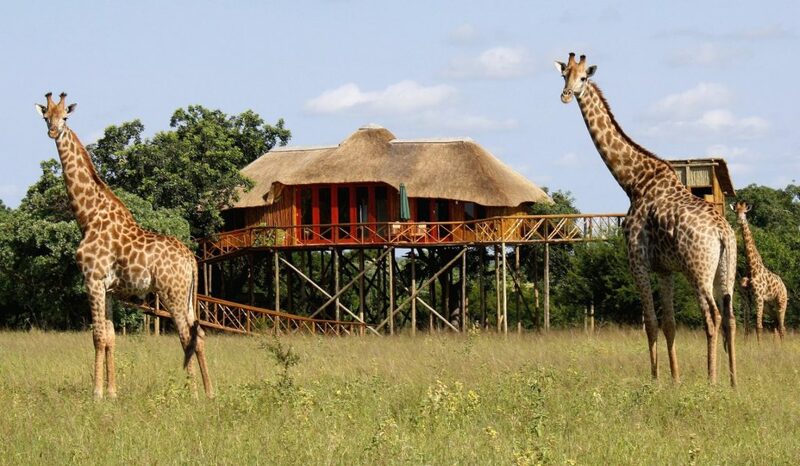 Every unit has a spacious balcony where you can view herds of animals passing below or view a giraffe eye to eye. Blending in beautifully with the African bush, solid wooden walkways lead high into your private tree house. All tree houses have an en-suite with an outdoor shower and/or a bath overlooking the bush. Each Treehouse is supplied with running (hot) water, electricity, tea and coffee facilities, electronic safes, overhead fans, heaters and mosquito nets. They are far away from each other and hidden from view to ensure privacy. All meals and alcoholic drinks are included in your stay. 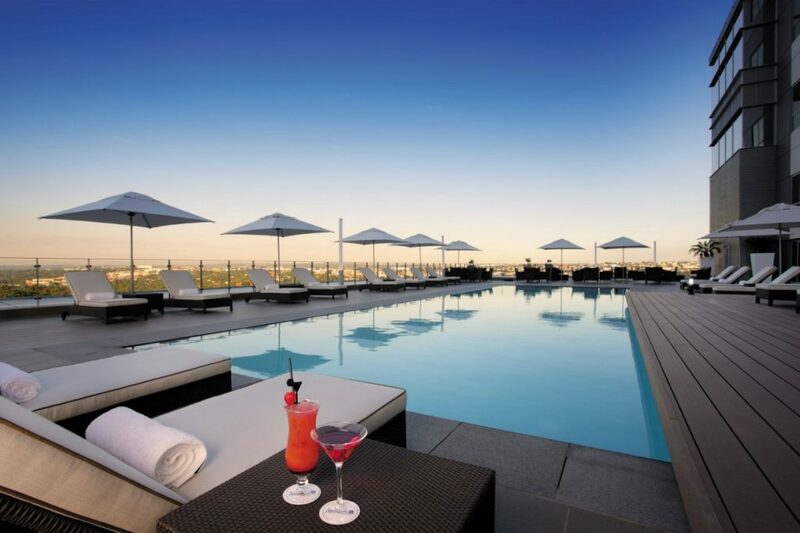 The Radisson Blu Gautrain Hotel, Sandton Johannesburg is located within walking distance of exclusive shopping, public transportation and the city’s premier business district. The famous Nelson Mandela Square and the popular Sandton City shopping mall are only 500 meters from the hotel in the upscale suburb of Sandton. A complimentary shuttle service to the Sandton City shopping mall is available through the hotel. Transport from and to the airport is in an air-conditioned minibus. While engaging in game viewing and activities, guests will be in an open air 4WD. Water stations will be available in the vehicle to re-fill your re-usable water bottle supplied.